How old does my dog/cat have to be to have spay/neuter surgery? Humane Ohio will spay/neuter kittens when they’re eight weeks old and at least two pounds, and puppies when they’re eight weeks old and 2-4 lbs. (depending on the breed). It’s a myth that you can’t spay/neuter kittens and puppies when they’re so young; they actually bounce back from spay/neuter surgery very quickly! Pediatric spay/neuter is safe and is less stressful on the animal than waiting until he’s older. To read more on the benefits of pediatric spay/neuter: see our Pediatric Spay/Neuter section below. Are your vets licensed? Will my pet get pain medication? Humane Ohio believes that all animals should receive the highest quality veterinary care possible, even if the services performed are at a reduced cost. We do not cut corners or quality. 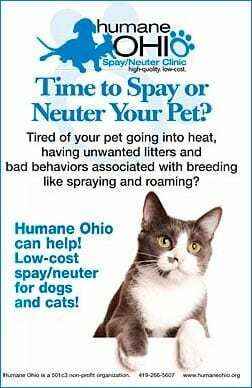 All spay/neuter surgeries are performed by our licensed veterinarians (DVMs) and all animals entrusted to Humane Ohio are attended to before and after surgery by trained veterinary technicians. Every patient receives pain medication. As with any surgery, there is a risk that goes along with spaying/neutering, but we believe the benefits to your pet (spaying eliminates the risk of ovarian cancer and neutering removes the risk of testicular cancer) and the reduction of pet homelessness outweigh the risks. All spay/neuter surgeries are performed by our licensed veterinarians (DVMs) and the animals are monitored while they are under anesthesia. The animals are never left alone while under anesthesia. While under anesthesia, every animal has a heart monitor on them so that any change in heart rhythm and/or speed can be detected immediately. After surgery, your pet will receive monitoring until he is moving his head and/or ready to walk, then he’ll be put in his kennel to rest and eat. Every patient receives pain medication. The spay/neuter surgery only takes between 5 to 20 minutes. My dog/cat just had a litter; can I still get her fixed? We prefer to wait about two weeks after the puppies/kittens are weaned before we spay the mother. The puppies/kittens must be completely weaned (eating solid food on their own, typically around 4-6 weeks of age) and separated from the mother so they aren’t snacking on mom in order for her milk to dry up and the spay to be performed. When the mother comes in for her spay surgery, she will be given a brief physical exam by our vet and our vet will determine whether or not her milk is dried up enough to proceed with the spay surgery. The mammary glands are very near the surgery area and can be easily touched during surgery, which will cause milk to spill over the surgery area if the milk is not dried up enough. What is the best age to fix your pet? We recommend doing it by four months to prevent accidental litters. Learn more and see how safe and easy it is at WhenToSpay.org.